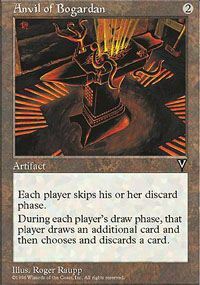 At the beginning of each player's draw step, that player draws a card, then discards a card from his or her hand. 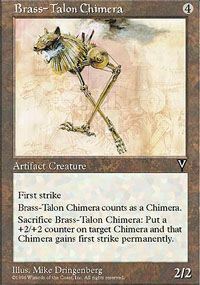 3,Tap: Put a 0/1 Prism artifact creature token into play. 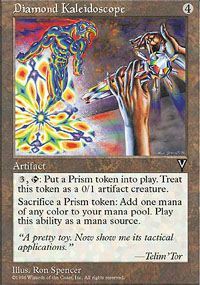 Sacrifice a Prism token: Add one mana of any color to your mana pool. 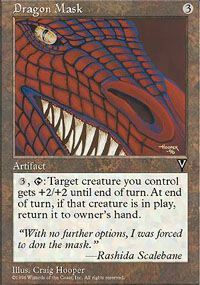 3,Tap: Target creature you control gets +2/+2 until end of turn. 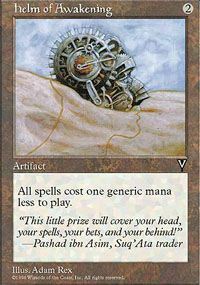 Return it to its owner's hand at end of turn. Spells cost one generic mana less to play. 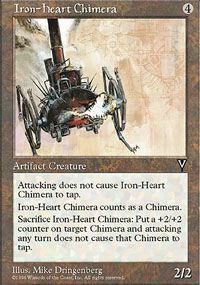 Attacking doesn't cause Iron-Heart Chimera to tap. 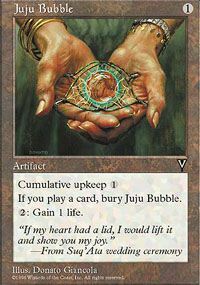 When you play a card, sacrifice Juju Bubble. 2: You gain 1 life. 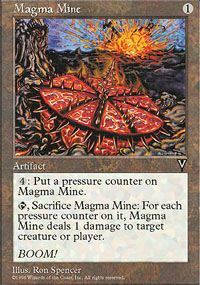 4: Put a pressure counter on Magma Mine. Tap, Sacrifice Magma Mine: Magma Mine deals damage equal to the number of pressure counter on it to target creature or player. 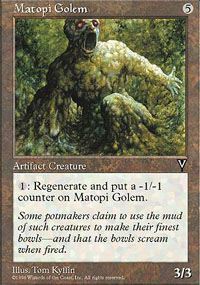 1: The next time Matopi Golem would be destroyed this turn, it regenerates and put a -1/-1 counter on it instead.